This is what I struggle with the most. 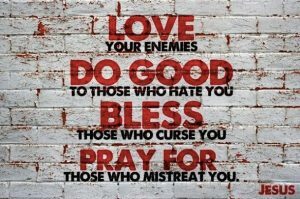 I know, on a theoretical level, that I must and should love my “enemies,” or adversaries, as I prefer to put it. But it is so difficult in practice. Especially when its not so black and white, right? That’s why I pasted that quote. Because it might actually be easier if we all just could step back and say “everything is fine and I love everyone” and then simply remain neutral in the face of everything, good or evil, kumbaya. But that’s not really love, is it? Lack of hatred isn’t automatically love. So I struggle with developing love for my adversaries, particularly in my line of work, while at the same time continuing to hold them accountable when they’ve done wrong. The kind of love a parent might have for their child, even when punishing them. Thanks Ryan, Grateful you’re among the thoughtful reading these posts. To be clear, I struggle with this too. I want my words, my feelings, my actions to be real and genuine. And Jesus’ words here are a challenge. The more I understand love the more I do think it’s a supernatural event though to truly love one who hates you. You might say that all of love is supernatural. Anyway, I’ll post again soon, thanks again for sharing this thought with me. Thanks for this thought provoking post, Tim! Look forward to reading more! Hi Aimee, hey I appreciate that. Thanks for letting me know.